A few days back, I was sitting on my couch, feeling extremely cold. It was a winter afternoon, with the sun shining brightly but the heat couldn't be felt. I noticed my cat who was happily stretching herself and basking in the sunshine in my balcony. I took the book I started reading recently and sat down on the swing, close to her. The next 90 minutes felt so blissful - reading an interesting book, soaking in the sunshine and admiring my beautiful feline friend. I didn't check my phone during this 1.5 hour time period. That's exactly what I wanted in 2017 - less screen time, more focused work, more outdoors. I hadn't set this goal in the last day of Dec on a whim. Rather, this has been lingering in my mind for a while. The hypothesis was that I had been checking my phone a little too much. To validate this hypothesis, I installed an app called Checky. I had monitored my usage for a period of 3 months, so the data is statistically significant. The results weren’t surprising. On an average, I was checking my phone around 35-45 times on a weekday, whereas on a weekend, the range was between 15-25 times. Based on my usual activity hours between 7AM - 10PM (15 hours), this amounts to checking my phone 3 times every hour. On 31st Dec, I spoke to a friend from school after a long time. She casually remarked that I seem to be spending a lot of time on Facebook. I knew that too and didn’t defend myself. On Jan 1st, I un-installed FB app from my phone. So much peace, I should say! “Social media is a source of entertainment. These companies offer you shiny treats for minutes of your attention and bites of your personal data, which can then be packaged up and sold. Many of the major social media companies hire individuals called “attention engineers” who borrow principles from casino gambling to try to make these products as addictive as possible"
He also talks about “the constant background hum of anxiety". I didn’t post anything on my FB account since Jan 1st while I continued to share food pictures in my EthnicPalate FB page. Yesterday (10th Jan), I shared a blogpost link that I wrote with so much passion on something I believe in. The background hum of anxiety kicked in and I felt the need to constantly check for likes/comments from my desktop. At the end of the day, I decided that this anxiety is detrimental to my productivity and focus. I argued with myself that I’ve only been sharing informative posts on healthy eating, fitness and productivity, and also that I haven't been posting much of photos/personal updates/jokes/memes/fwds etc. But it also hit me that I don't want to be constantly distracted and would rather stay away from any anxiety related to likes/comments. If I’m sharing something, then I’m contributing a teeny tiny bit to the reason behind someone’s social media addiction. Imagine if everyone stops adding updates to our timeline, then there won't be any reason for us to visit social media sites, right? Why not moderation? one might ask. I believe moderation will not work in the case of digital addictive products, where we don’t really “feel” the limit. Even if you LOVE donuts so much, you can’t eat more than say 2 or 3 pieces. Your tongue would signal you, saying “Enough” :-) But in the case of social media, you might think you’d casually browse for a couple of minutes. But you would end up scrolling through the timeline for 15 minutes and also end up with 10 new tabs open. And the worse part is that this would happen EVERY single day. So long story short, I have decided to take a break from social media (FB, twitter, Instagram) and regain my attention and focus. I will continue to pursue my passions more rigorously - writing, cooking, reading, productivity hacking, fitness etc. I have a long list of books to read, topics to write about, recipes to try and new projects to kickstart. I will be writing more frequently in both my websites - this one for all blogposts and EthnicPalate for all food related (ideas, recipes, pictures). But I don’t want to share them through addictive channels like FB/twitter/instagram on a daily basis. Here’s a little time management tip - off late, I have started scheduling 15-min time slots once a week/fortnight to go through blogs/work of people whom I like to follow. This helps me to be more aware of my time and the outcome is also more focused. Do try this tip. Also, if you find my posts valuable, I recommend that you schedule a 15-min slot once a fortnight in your calendar to check my blogs. That way, it would be a focused conscious activity and not a random update on social media on a daily basis. Thanks for your understanding. If you would like to connect, drop me an email at anuradha.sridharan at gmail dot com. Hopefully, with the distraction-free times, I’ll be able to increase my productivity and accomplish more in 2017. 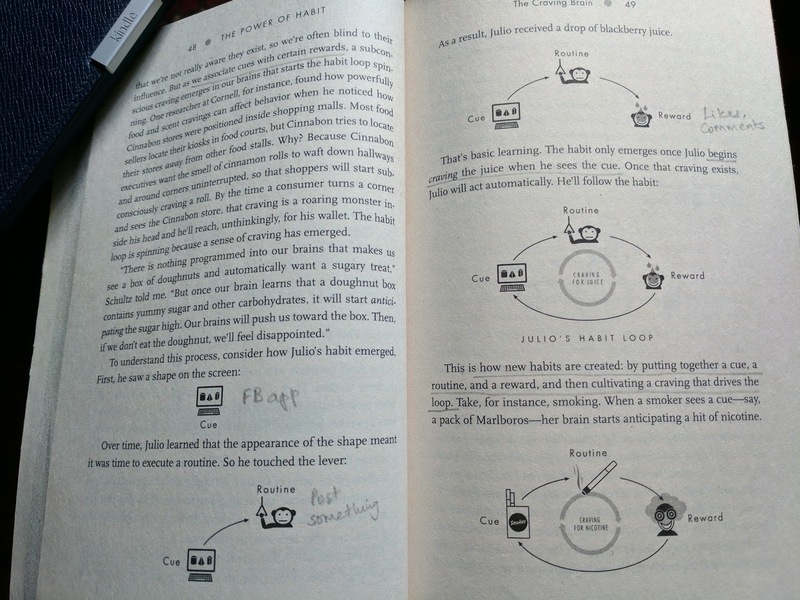 BTW, the book that kept me hooked for 90-min that afternoon is "The Power of Habit" by Charles Duhigg. Fascinating read so far. It talks about how habits are formed and how we can break them. Will post a detailed review once I finish it. Good Decision, Anu. Feed your focus and starve those distractions. Say bye bye to anxiety and hello to productivity! Wish you a very fruitful new year!